This is “Macroeconomics for the 21st Century”, section 17.3 from the book Macroeconomics Principles (v. 2.0). For details on it (including licensing), click here. 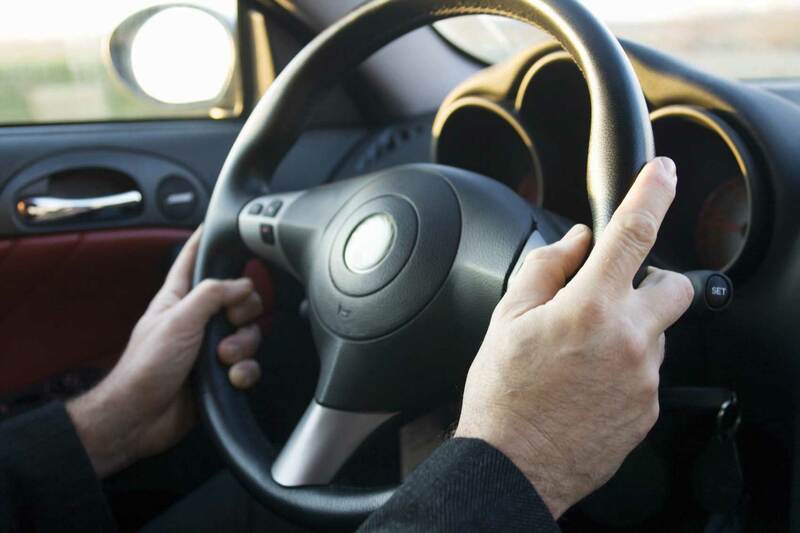 Following the recession that ended in 1982, the last two decades of the 20th century and the early years of the 21st century have sometimes been referred to as the Great Moderation. Yes, there were recessions, but they were fairly mild and short-lived. Prematurely, economists began to pat themselves on the backs for having tamed the business cycle. There was a sense that macroeconomic theory and policy had helped with this improved performance. The ideas associated with macroeconomic theory and policy incorporated elements of Keynesian economics, monetarism, and new classical economics. All three schools of macroeconomic thought contributed to the development of a new school of macroeconomic thought: the new Keynesian school. Oil prices rose sharply in 1979 as war broke out between Iran and Iraq. Such an increase would, by itself, shift the short-run aggregate supply curve to the left, causing the price level to rise and real GDP to fall. But expansionary fiscal and monetary policies had pushed aggregate demand up at the same time. As a result, real GDP stayed at potential output, while the price level soared. The implicit price deflator jumped 8.1%; the CPI rose 13.5%, the highest inflation rate recorded in the 20th century. Public opinion polls in 1979 consistently showed that most people regarded inflation as the leading problem facing the nation. Chairman Volcker charted a monetarist course of fixing the growth rate of the money supply at a rate that would bring inflation down. After the high rates of money growth of the past, the policy was sharply contractionary. 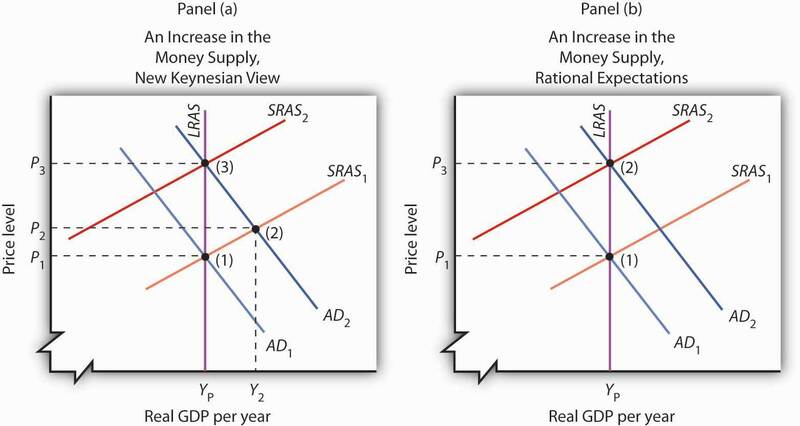 Its first effects were to shift the aggregate demand curve to the left. Continued oil price increases produced more leftward shifts in the short-run aggregate supply curve, and the economy suffered a recession in 1980. Inflation remained high. 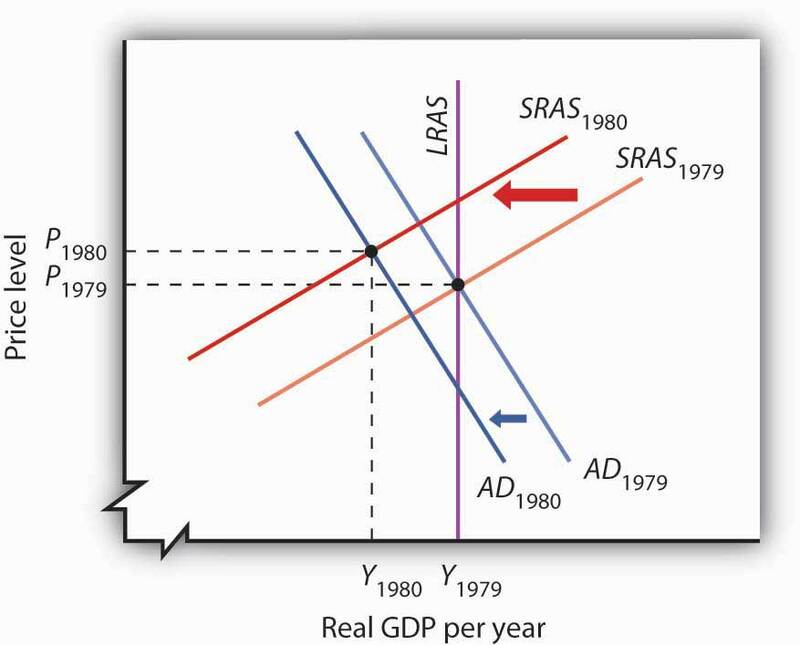 Figure 17.8 "The Fed’s Fight Against Inflation" shows how the combined shifts in aggregate demand and short-run aggregate supply produced a reduction in real GDP and an increase in the price level. The Fed stuck to its contractionary guns, and the inflation rate finally began to fall in 1981. But the recession worsened. Unemployment soared, shooting above 10% late in the year. It was, up to that point, the worst recession since the Great Depression. The inflation rate, though, fell sharply in 1982, and the Fed began to shift to a modestly expansionary policy in 1983. But inflation had been licked. Inflation, measured by the implicit price deflator, dropped to a 4.1% rate that year, the lowest since 1967. As the economy continued to weaken in 2008, there was a resurgence of interest in using discretionary increases in government spending, as discussed in the Case in Point, to respond to the recession. Three factors were paramount: (1) the temporary tax cuts had provided only a minor amount of stimulus to the economy, as sizable portions had been used for saving rather than spending, (2) expansionary monetary policy, while useful, had not seemed adequate, and (3) the recession threatening the global economy was larger than those in recent economic history. Look again at Figure 17.6 "M2 and Nominal GDP, 1960–1980". The close relationship between M2 and nominal GDP in the 1960s and 1970s helped win over many economists to the monetarist camp. 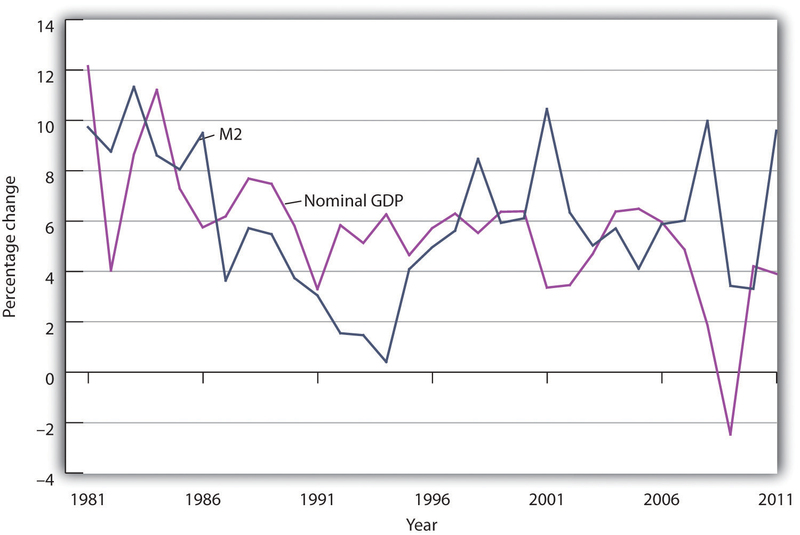 Now look at Figure 17.9 "M2 and Nominal GDP, 1980–2011". It shows the same two variables, M2 and nominal GDP, from the 1980s through 2011. The tidy relationship between the two seems to have vanished. What happened? The events of the 1980s do not suggest that either monetarist or new classical ideas should be abandoned, but those events certainly raised doubts about relying solely on these approaches. Similarly, doubts about Keynesian economics raised by the events of the 1970s led Keynesians to modify and strengthen their approach. While there is less consensus on macroeconomic policy issues than on some other economic issues (particularly those in the microeconomic and international areas), surveys of economists generally show that the new Keynesian approach has emerged as the preferred approach to macroeconomic analysis. The finding that about 80% of economists agree that expansionary fiscal measures can deal with recessionary gaps certainly suggests that most economists can be counted in the new Keynesian camp. Neither monetarist nor new classical analysis would support such measures. At the same time, there is considerable discomfort about actually using discretionary fiscal policy, as the same survey shows that about 70% of economists feel that discretionary fiscal policy should be avoided and that the business cycle should be managed by the Fed.Dan Fuller and Doris Geide-Stevenson, “Consensus among Economists: Revisited,” Journal of Economic Education 34, no. 4 (Fall 2003): 369–87. Just as the new Keynesian approach appears to have won support among most economists, it has become dominant in terms of macroeconomic policy. In the United States, the Great Recession was fought using traditional monetary and fiscal policies, while other policies were used concurrently to deal with the financial crisis that occurred at the same time. Did the experience of the 2007–2009 recession affect economists’ views concerning macroeconomic policy? One source for gauging possible changes in the opinions of economists is the twice-yearly survey of economic policy among the National Association for Business Economics (NABE).National Association for Business Economics, Economic Policy Surveys, March 2009 and August 2010, available at http://www.nabe.com. According to the August 2010 survey of 242 members of NABE, almost 60% were supportive of monetary policy at that time, which was expansionary and continued to be so at least through the middle of 2012. Concerning fiscal policy, there was less agreement. Still, according to the survey taken at the time the 2009 fiscal stimulus was being debated, 22% characterized it as “about right,” another third found it too restrictive, and only one third found it too stimulative. In the August 2010 survey, 39% thought fiscal policy “about right,” 24% found it too restrictive, and 37% found it too stimulative. Also, nearly 75% ranked promotion of economic growth as more important than deficit reduction, roughly two thirds supported the extension of unemployment benefits, and 60% agreed that awarding states with federal assistance funds from the 2009 stimulus package was appropriate. Taken together, the new Keynesian approach still seems to reflect the dominant opinion. As did the Great Depression of the 1930s, the Great Recession of the late 2000s generated great fear. Even though it officially ended in the middle of 2009, the state of the economy was the major issue over which the 2012 U.S. presidential election was fought, as the two major political parties offered their competing visions. Unemployment was still high, the housing sector had still not recovered, and the European debt situation loomed in the background. Another lurking question was whether the experience of the recent deep recession, the related financial crisis, and the slow recovery from them would become the new “normal” or whether macroeconomic performance would return to being less volatile. Economist Todd Clark at the Federal Reserve Bank of Kansas attempted to answer this question.Todd E. Clark, “Is the Great Moderation Over? An Empirical Analysis,” Federal Reserve Bank of Kansas City Economic Review 94, no. 4 (Fourth Quarter 2009): 5–42. He first looked at the various explanations for the lower volatility of the U.S. economy during the 25-year period that preceded the Great Recession. Three broad reasons were given: structural changes, improved monetary policy, and good luck. While there is disagreement in the literature as to the relative importance of each of these, Clark argues that there is no reason to assume that the first two explanations for moderation will not continue to have moderating influences. For example, one positive structural change has been better inventory management, and he sees no reason why firms should become less able in the future to manage their inventories using the newly developed techniques. Similarly, in the future, monetary authorities should be able to continue to make the better decisions that they made during the Great Moderation. The element that can vary is luck. During the Great Moderation, the economy experienced fewer serious shocks. For example, oil prices were fairly stable. In contrast, during the recent recession, the price of oil rose from $54 per barrel in January 2007 to $134 per barrel in June 2008. The bursting of the housing price bubble and the ensuing crisis in financial markets was another major shock contributing to the depth and length of the recent recession. Clark says, “Accordingly, once the crisis subsides and the period of very bad luck passes, macroeconomic volatility will likely decline. In the future, the permanence of structural change and improved monetary policy that occurred in years past should ensure that low volatility is the norm.”Ibid., 27. Let’s hope that he is correct. Since 2008, both the Fed and the government have been again trying to get the economy back on track. In this case, the car was already in the ditch. The Fed decided on a “no holds barred” approach. It moved aggressively to lower the federal funds rate target and engaged in a variety of other measures to improve liquidity to the banking system, to lower other interest rates by purchasing longer-term securities (such as 10-year treasuries and those of Fannie Mae and Freddie Mac), and, working with the Treasury Department, to provide loans related to consumer and business debt. Predictably, not all economists jumped onto the fiscal policy bandwagon. Concerns included whether so-called shovel-ready projects could really be implemented in time, whether government spending would crowd out private spending, whether monetary policy alone was providing enough stimulus, and whether the spending would flow efficiently to truly worthwhile projects. As discussed elsewhere in this text, the controversy persists. But the fact that a variety of expansionary policies were used to ease the recession and spur the recovery is not in doubt.